I had a reader comment a couple months ago regarding a skincare line they thought I should try for my hormonal acne. I looked into it right away, and boy am I glad I did, because the result was a wonderful new discovery of the brand Citrus Clear. If you’re the reader who told me about this, thank you! I’ve been really interested in natural remedies, organic and holistic skincare, and more, and although I’m not switching to a completely clean lifestyle I’m certainly interested in cleaner products if they actually work. 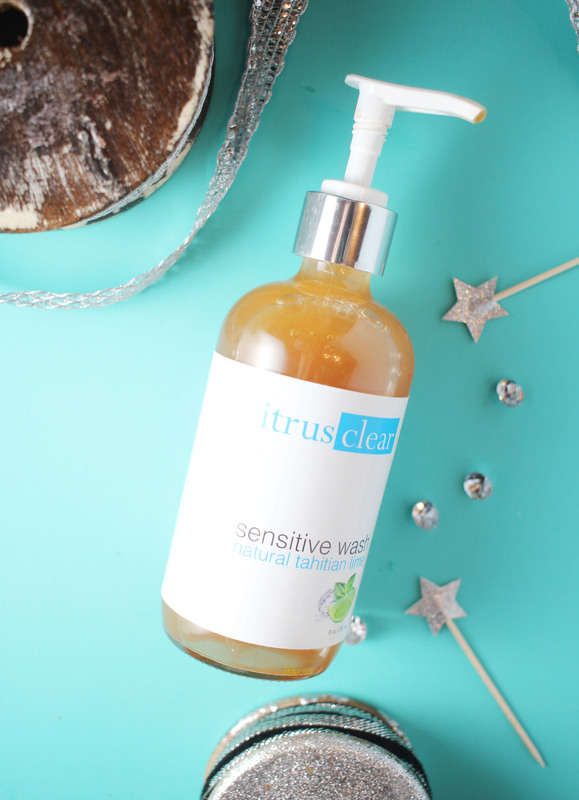 Citrus Clear is a natural and holistic treatment for acne, sensitive skin, and all skin types. I used the Sensitive Line on my combination/dry skin and had really great results that I wanted to share. Citrus Clear has two different lines- their Sensitive line and their Control line. The Control is meant to combat acne and the Sensitive is meant for maintaining. I tried the Sensitive for my skin since it’s really dry right now and I wasn’t sure whether my skin could handle more than that. The four products they sent me to try were the Sensitive Wash, Sensitive Moisturizer, Pore & Blackhead Extracting Mask, and Tangerine Tingle. Using just a few products like this is way more basic than I usually go with my skincare, but I gave it a whirl and added in extra products here and there where I felt I needed them. I am obsessed with the ingredients so I included each in a list after I talk about them, but I’ll go into more depth on that at the end! First, the Sensitive Wash. The scent of this product is to die for. It’s a natural tahitian lime that is so uplifting and refreshing to me that I wish I could bottle it up into a perfume. This can be used twice a day, morning and night. I will usually use it twice a day, but when I take my makeup off, I do need something additional as it’s a face wash and not a makeup remover. I have been using the last few pumps of my One Love Organics Vitamin B Cleansing Oil for that job lately, and following up with the Sensitive Wash. I love how clean my face feels when I use this, without being stripped of all of its natural oils. Ingredients: Organic Citrus Herbals, Organic Aloe Vera Juice, MSM, Lavender Hydrosol, Decyl Glucoside, Cocamidopropyl Hydroxysultaine, Cocamidopropyl Betaine (from coconuts), Cocamide MIPA, Disodium Laureth Sulfosuccinate, Disodium Lauryl Sulfosuccinate, Hydroxyethyl Cellulose, Carrageenan Gum, Olive Oil, Vitamin C, Tahitian Lime Fragrance, Wildcrafted Willow Bark, Wildcrafted Lemon Balm, Orange Hydrosol, Citrus Lemon Essential Oil, Citrus Lime Essential Oil, Mandarin Essential Oil, Orange Peel Extract, Peppermint Essential Oil, Grapefruit Seed, Organic Rosehip Oil, Borage Oil, Oregano Oil, Tea Tree Oil, Calendula, Burdock Root, Red Clover, Rosemary, Vitamin E, Sodium Benzoate, Potassium Sorbate, Ethyl Hexyl Glycerin. Next up is Tangerine Tingle. This is such a neat product. I have used this both as an exfoliating face wash and as a face mask. The scent is the citrus smell of tangerine, lemon, and orange peel extract. When I simply wash my face with this, it feels a lot softer and smoother afterwards. When I used it as a mask on my dry, clean face, it really starts to tingle! It’s not too harsh for my skin and I love the ingredients, some of which include glycolic acid, organic aloe vera, and Vitamin C.
Ingredients: Organic Citrus Herbals, Organic Aloe Vera Juice, Olive Seed, Tangerine Essential Oil, Pink Grapefruit Essential Oil, MSM, Jojoba Beads, Amino Acids, Hydroxyethyl Cellulose, Carrageenan Gum, Vitamin C, Organic Rhubarb, Organic Blueberry, Wildcrafted Lemon Balm, Grapefruit Seed Extract, Orange Hydrosol, Lemon Essential Oil, Citrus Lime Essential Oil, Mandarin Essential Oil, Orange Peel Extract, Peppermint Essential Oil, Vitamin E, Sodium Benzoate, Potassium Sorbate, Ethyl Hexyl Glycerin. 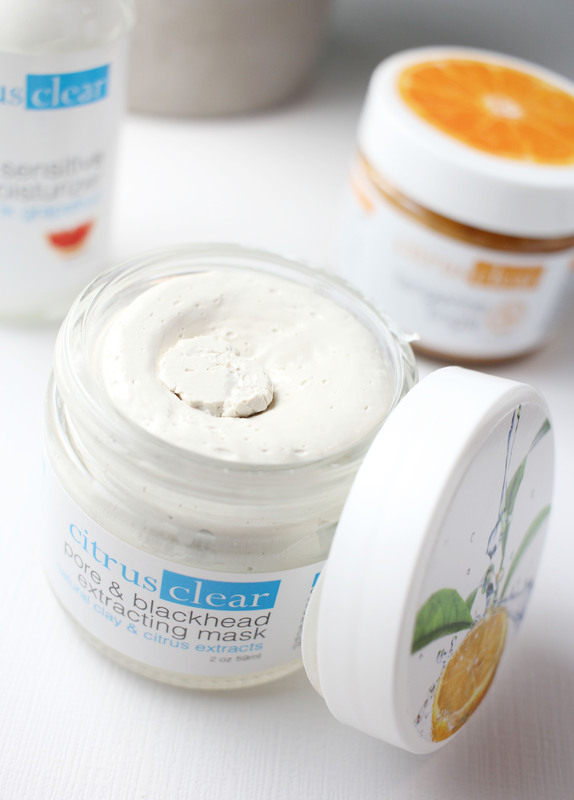 Next up, my absolute FAVORITE find for skincare, possibly ever- the Pore & Blackhead Extracting Mask. I have these sebaceous filaments on my nose (they’re not as gross as the ones on google) and I am always having to squeeze the gunk out of them. My skin is combination/dry and I wouldn’t even describe my nose as oily, but for some reason my pores keep getting gunky right there and even after I get rid of them, they come right back. My nose really benefits from a good clay mask, and this is the best one I’ve ever found. I use this just as a spot mask, and I wash it off before it’s completely dried. I use this a couple times a week and it works amazingly well to dry up what’s inside of those pores and bring it all to the surface. It’s kind of gross/cool to see the results of using this after a couple weeks! I scratched what was originally a deep blackhead right off the side of my nose after using this. Yuck! Yay! Ingredients: Organic Citrus Infusion, Organic Aloe Vera, Kaolin clay, Sodium Magnesium Silicate, Magnesium Aluminum Silicate, Cellulose Gum, Purified Smectite Clay, Vanilla, Sweet Orange Essential Oil, Wildcrafted Lemon Balm Extract, Orange Hydrosol, Lemon Essential Oil, Citrus Lime Essential Oil, Mandarin Essential Oil, Orange Peel Extract, Phenoxyethanol, Ethyl Hexyl Glycerin, Spirulina, Sea Kelp, Grapeseed Oil. Last, I have the Sensitive Moisturizer. This is a super light moisturizer and it smells like pink grapefruit. It wears well on its own and under makeup. It is somewhat hydrating on its own, but when my skin is as dry as it is right now, I add a moisturizing serum like the One Love Organics Vitamin B Cleansing Oil for a little bump in moisture. The texture of my skin has greatly improved since using this. I’m using it morning and night layered with the OLO serum at the moment. I love the skin healthy ingredients that are in this. Ingredients: Organic Aloe Vera, Palm Oil, Silk Protein Amino Acid Blend, Glycine, L-Alanine, L-Serine, L-Valine, L-Proline, L-threonine, L-Isoleucine, L-Histidine, L-Phenylalanine), Kosher Vegetable Glycerin, Cetyl Alcohol, Stearic Acid, Glyceryl Stearate, Organic Safflower Oil, MSM, Pink Grapefruit Essential Oil, Vitamin C, Botanical Hyaluronic Acid, Wildcrafted Lemon Balm, Grapefruit Seed Extract, Orange Hydrosol, Lemon Oil, Citrus Lime Essential Oil, Mandarin Essential Oil, Orange Peel Extract, Peppermint Essential Oil, Organic Jojoba Oil, Shea Butter, Vitamin B5, Phenoxyethanol, Ethylhexyl Glycerin, Xanthan Gum, Wildcrafted Green Tea, Citric Acid. So what’s the verdict? My skin is looking clearer than it’s ever looked in my adult life right now and I doubt it’s a coincidence that everything I’m using on it at the moment is organic or holistic. 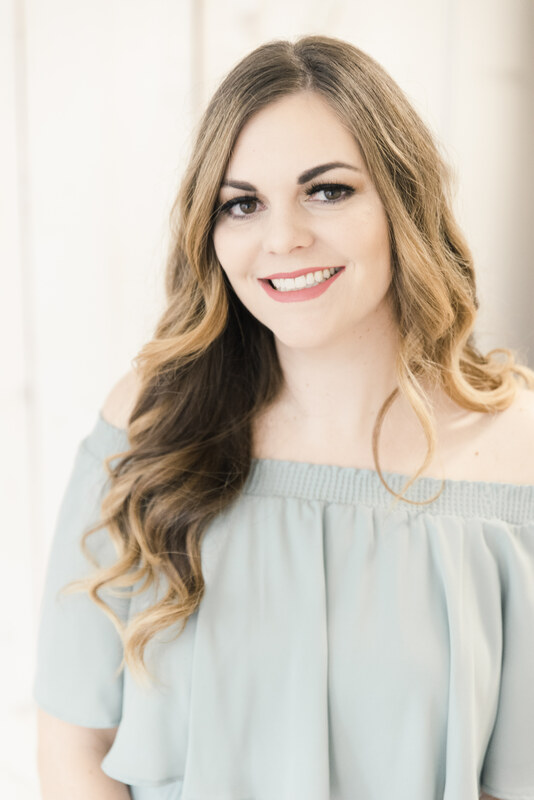 I became super interested in the science behind the products and I have been checking out some of the ingredients to see what makes these such great products. I’ve become kind of an ingredient nerd recently, so I am excited to see so many good ones in this product line. There are no toxic ingredients in any of these formulas. They are chock full of flowers, citrus fruits, herbs, extracts, and ocean minerals. I’m also interested in their clinical studies and I’m motivated to try applying some of the essential oils I have to my skin on some of my problem spots- orange, lemon, etc. 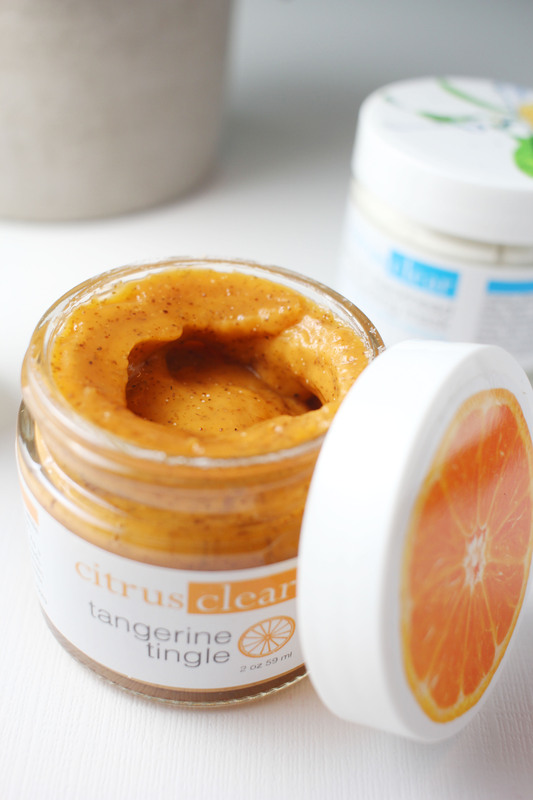 Citrus oils have antibacterial properties and that’s why they are working so well at preventing acne. I am going to stick with these products for a while because they are working so well for me. I just ran out of my OLO cleansing oil and serum at the same time this week (and desperately want to replace them soon) but I am definitely going to keep the Citrus Clear products in my rotation for the foreseeable future. I’ve already ordered the Grapefruit Acne Spot Treatment and their Skin Repair Moisturizer to try next. I’m seriously obsessed! 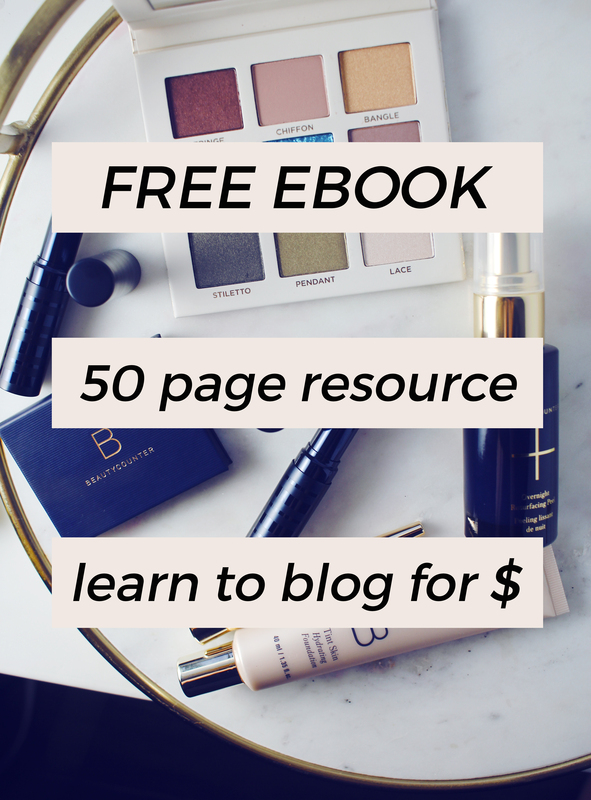 Have you heard of any of these products or tried them? Thanks to the reader who recommended these! 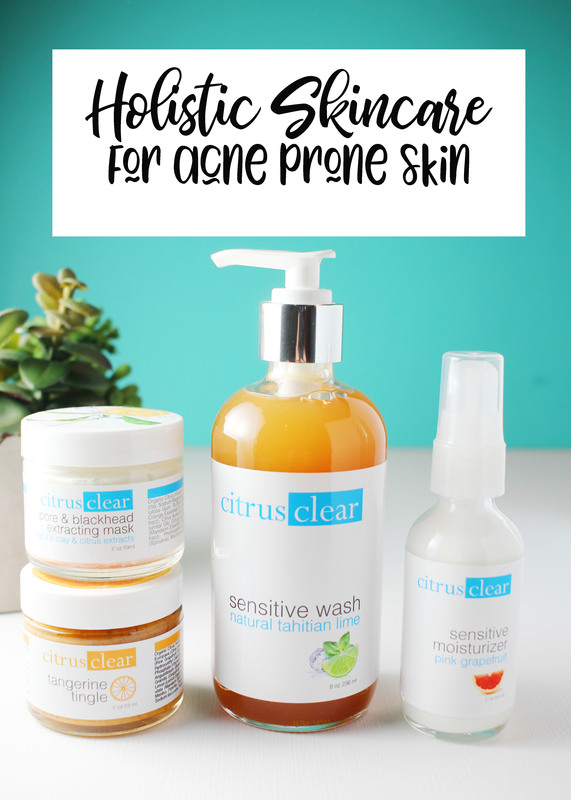 Buy Citrus Clear at Citrusclear.com or Amazon.com. These products regularly go on sale too! If you do start using essential citrus oils on your skin make sure that they have the photo-sensitivity (can’t remember the exact name starts with a T) aspect removed. I’m sure they are with this brand but something to keep in mind. This brand looks like such a great idea, can’t wait to check it out myself! You totally should, and thanks for the tip! I’ve noticed they are often on sale on Amazon. I just got the Grapefruit Spot Treatment and the other moisturizer in the mail the other day and I’m already loving them! 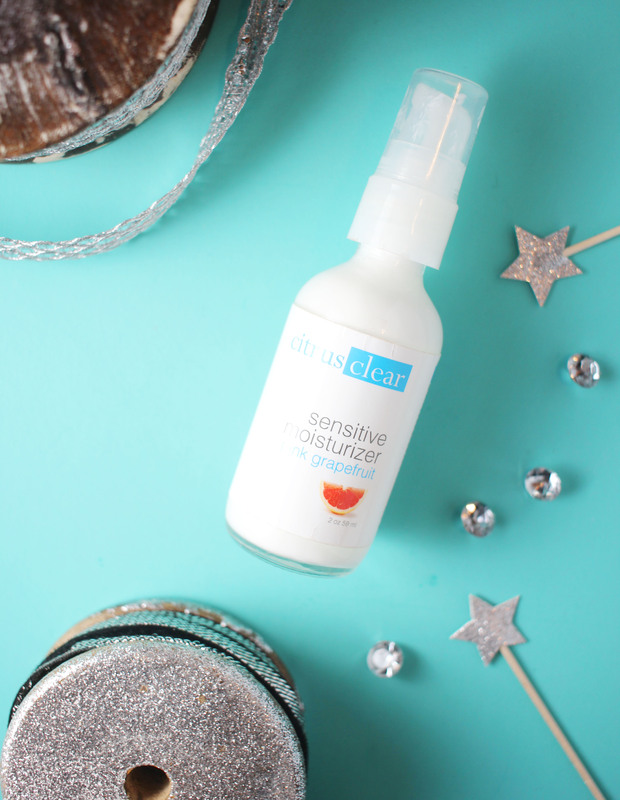 Thank you for sharing about your thoughts regarding photosensitivity in Citrus Clear. Photosensitivity is quite inherent in citrus-based products but only when skin is exposed to direct sunlight. So I would suggest that you apply a broad spectrum sunscreen to avoid pigmentation or skin discoloration. This is a really good information. Thanks for sharing! I’m glad you found new love with Citrus Clear. I too am enjoying the benefits these products give when it comes to skincare. After years of cycling through acne creams, trying my grandma’s secret acne care solutions, and baking in the sun trying to clear up my acne; this stuff has really helped me out. It’s great to see that there is finally a natural, holistic remedy for my stubborn face acne that actually works, thank you for this life changing article.